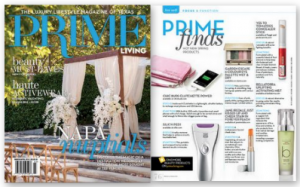 Congratulations to our Client Chic Buds for their feature in PRIME Living Magazine! Dedicated to products inspired by and designed for real women, Chic Buds knows the importanceÂ of combining fashion with function. With so many other options offering pretty, but lacking purpose, Chic Buds is changing the way the Tech World serves women by bringing them quality tech accessories that not only look great, but fit into their busy lives seamlesslyâ€”something any woman can fall in love with! With Clutchette Power, convenient phone charging power is always at hand and concealed in a sophisticated clutch. Featuring a lightweight, ultrathin battery to recharge smart phones and USB devices on-the-go, itâ€™s the modern womanâ€™s go-to for fashionÂ and function. Check them out at chicbuds.com!